I think that the third book in the trilogy has the most pressure to be completely awesome. The first is either a surprise gem or one that you know you'll love and you do. The second either keeps the reveals coming or sadly falls into "middle book syndrome." But if you've made it through the first two, then most likely you're all on board for the third -- and hoping that it will be action-packed and tie up everything in the world nicely. Luckily, Goddess did just that. Our Greek hotties Lucas and Orion did not disappoint. I enjoyed the new character, Andy. And I closed the last page of the book with a smile on my face. Nicely done, Josie. Without being too spoilerific, the only down side of this one was that the many dreams/flashbacks that Helen was having, as well as how they played out in the present, got a little confusing at times. There was a lot of different versions of the characters to figure out and having to sort through all that in my head as well as follow the story line of the book was a little overwhelming. Also, I know this has nothing to do with the content of the book, but I'm really not a fan of the covers. Too....amorphous? Which is probably the effect they're going for, but I've been secretly hoping this whole time that this would be one of those trilogies where they books get new covers, and it hasn't happened yet. Hopefully, down the road they will. But back to the book -- it delivered on the action and kept me reading straight through for the majority of a day. It's a great finish to a great trilogy, and I'm sad to say goodbye to it. I'm looking forward to reading whatever Josie writes next. 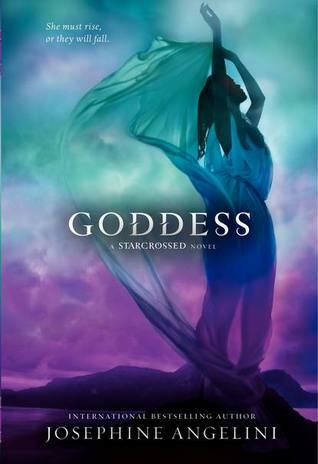 Josie does a remarkable job of incorporating Greek Mythology into a contemporary story. I felt like we learned a lot more about the characters and could really appreciate the struggles they were experiencing. The tension and frustration between Helen, Lucas, and Orion was palpable and had me on the edge of my seat the majority of this book. This is one series that did not disappoint.